I recently returned to my hometown of Quispamsis, New Brunswick to visit family. It was the perfect opportunity to explore what the province has to offer for culinary delights. 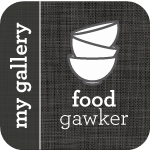 I grew up in New Brunswick but this was an excellent chance to find out what is new on the scene as well as re-visit old favourites such as lobster and traditional Maritime home cooking. I had heard positive reviews of the food at the Rossmount Inn in St. Andrews so I was excited to have the opportunity to dine there with my parents. Luckily it did not disappoint. The dining room at the inn is warm and welcoming and the service friendly and efficient. The menu is based on local, seasonal ingredients and is updated frequently. The three of us sampled a range of items from the creative menu. Some highlights included a fiddlehead-asparagus bisque with a fantastic curry-hemp oil drizzle, a candied beet salad with shaved fennel and a moist pancetta-sage wrapped pork tenderloin. The dessert menu had a number of tempting treats but I couldn’t resist ordering ‘Breakfast for Dessert’: vanilla french toast with blueberry syrup, cinnamon crisp and maple-bacon ice cream. The secret to eating it is to taste all of the elements together so you get a hit of sweet, creamy and a bit of smokiness all at once. It tasted just like – breakfast for dessert! It was refreshing to see something so creative on a menu and an interesting change from the old standbys. Of course for those who enjoy the classics, the swiss chocolate truffle cake was perfectly executed. We also had a beautiful cheese plate to finish, featuring New Brunswick cheeses (more on that later!). 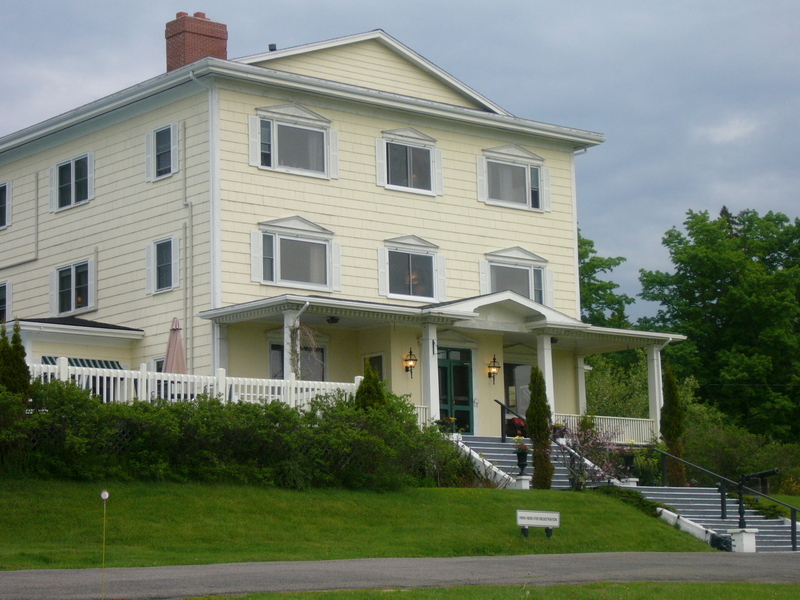 You can visit www.rossmountinn.com for further information on the inn and restaurant. 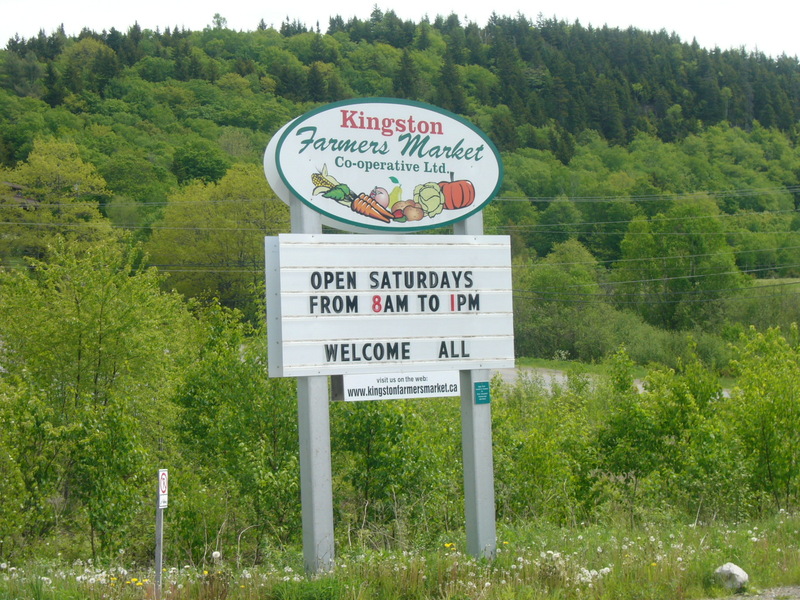 The Kingston Farmer’s Market is held each Saturday morning on the Kingston Penninsula. I wasn’t sure what to expect but was pleasantly surprised at the variety of foods available. There is a traditional breakfast available but a number of stands were cooking up specialties from places as diverse as India, Germany and Jamaica. There was even a stand with Kurdish food. The more traditional New Brunswick favourites were also there, including maple syrup, local honey and homemade jams and relishes. There wasn’t very much local produce available because the growing season has just begun but as summer progresses farmers will start bringing their fruits and vegetables. Visit www.kingstonfarmersmarket.ca for more detailed information. Some of the best food you can eat in New Brunswick is in people’s homes. Luckily for home cooks, there are an abundance of excellent local products to work with. 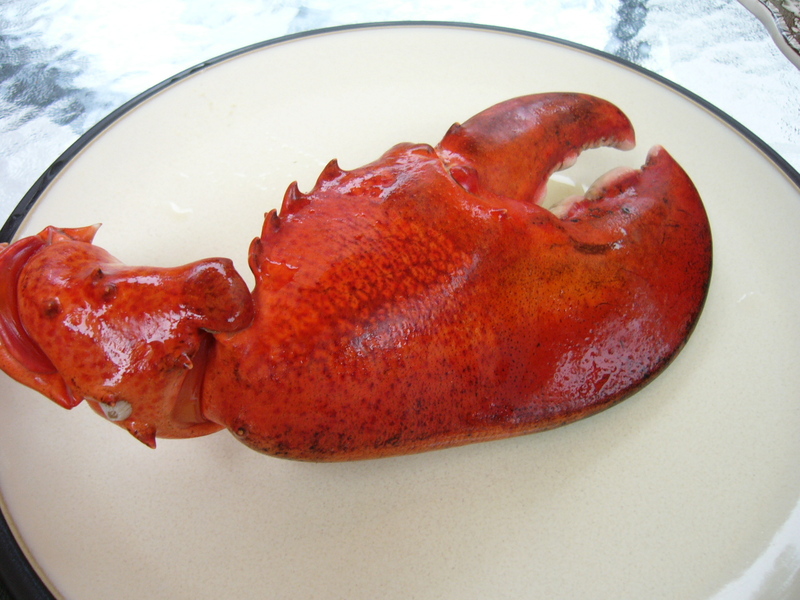 We ordered some lobsters from Misty Harbour Seafood (http://www.mistyharbourseafood.com) and they were fantastic! 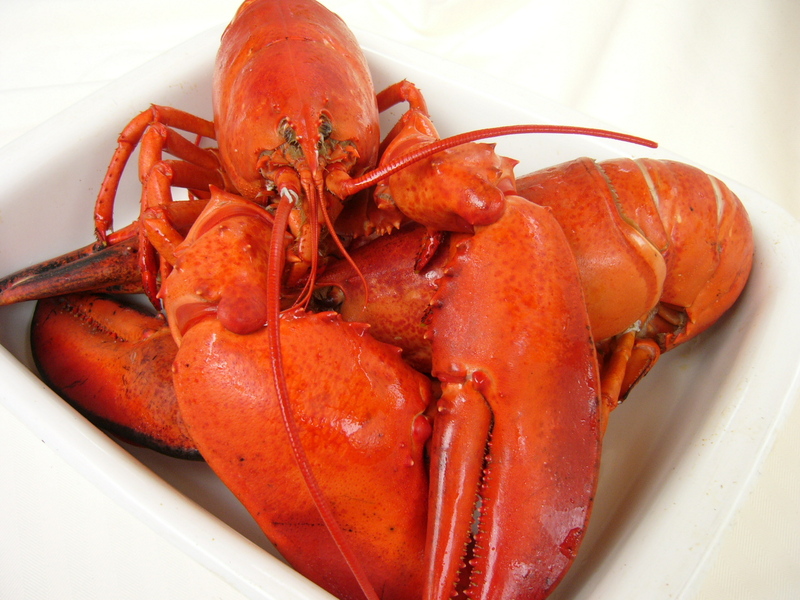 Each lobster was at least 2-1/2 to 3 lbs, with the largest weighing in at close to 3-1/2 lbs. The meat was sweet and succulent and we ate them out of the shell with melted butter for dipping. Simple and delicious. There was enough left over to use the next day for lobster rolls or for a quiche or seafood pot pie. You can purchase them live to cook at home or pre-order them cooked for you. We also picked up some scallops and pan fried them simply in butter with a light dusting of flour, salt and pepper. They tasted exactly how good scallops should: sweet, firm and fresh. Divine! Note that the giant claw is sitting on a standard 13″ dinner plate! Despite our delicious seafood feasts, sometimes you feel like having some decent meat or poultry. 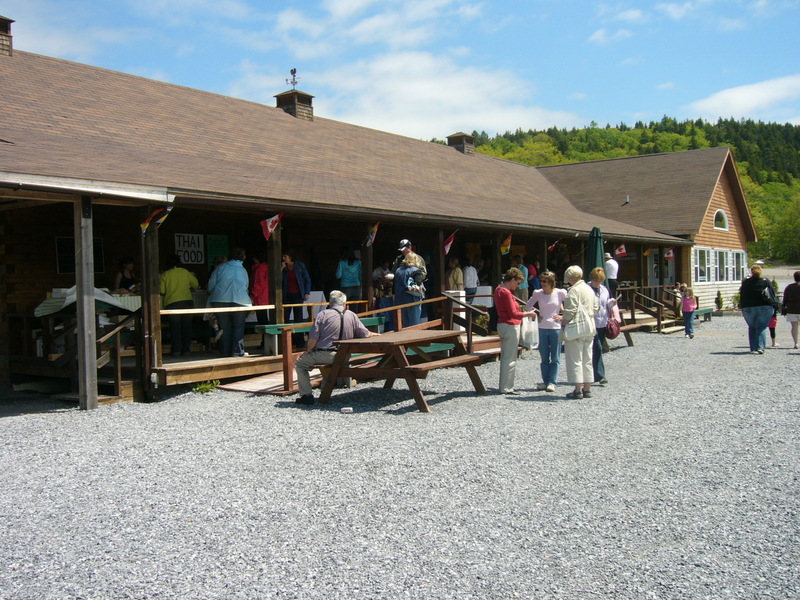 We paid a visit to Kuinshoeve Meat Ltd. (www.kuinshoeve.ca) in the Kennebecasis Valley. They specialize in New Brunswick raised, hormone-free meat and chicken. We tried the veal rib chops and a free-range chicken. The chicken weighed in at close to eight pounds – more like a small turkey! We grilled the veal and it was tender and juicy. The chicken was oven roasted with some herbs, lemon and garlic and the roasted meat was moist and delicious with a crispy, bronzed skin. Ive just recently decided to go around the province eating in local restaurants and looking for organic and fresh produce. Ive been very impressed with how available this food is to us, if you only look. Really liked your blog. I need to go to St Andrews!